Collages, whether made of words, paper, objects or cloth, have always been my means of expression. In 1988, I first coined the term “Silkollages” to introduce my meditative concept in textile collages to interior designs. Then in 1992, I added “Ethnikollages” to re-activate cultural interests. My collages are either embroidered into miniature quilts, or framed into window boxes. When large and three-dimensional, they become hanging art quilts or soft installation pieces. Abstract or representational life forms as dancing shapes seem to multiply in my work. I draw them out of colorful cloth from Asia, Africa and Europe to visually create a blurring of boundaries between such cultures. As a collage maze is formed, the viewers are invited to enter it. If my playing on fabric brings the viewers to rethink the multiplicity expressed, an expansion of their own true awareness might occur. What I seek is an element of uncensored, emotional surprise, beyond multicultural reality. I am on a spiritual exploration, deepening my sense of what it really means to belong to the human race. It is about exploring that sense of oneness, born out of welcoming the difference we are. 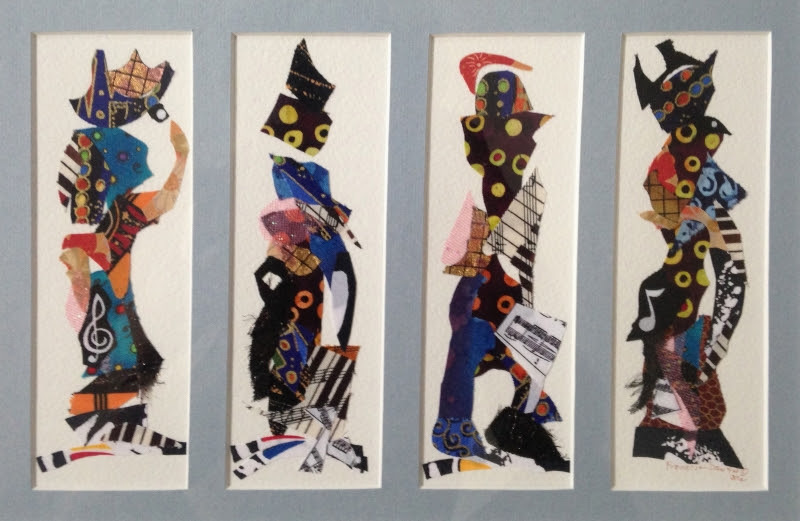 Francelise Dawkins is a Parisian “textile collagist”, living in the U.S. for over two decades. She first studied Fiber Arts at the Art League School of Indianapolis before moving to NY, where she developed her meditative concept for interior designs in textile collages. She has since exhibited or taught at the American Craft Museum in NYC, the Smithsonian Institute in Washington DC, the New Orleans Museum of Art, the NY State Museum in Albany, NY, and other renowned venues. One of her installations was part of the “Putt-Modernism” show at the Hyde Collection Museum in Glens Falls, NY. Writing about her art, she had essays published, such as the one on intuition in Margaret Blanchard’s book: “From the Listening Place”. She designed the art cover for Gisele Pineau’s French novel: “L’Espérance-Macadam”. Many of her pieces have been shown in magazines, on cable network TV and books, such as Carolyn Mazloomi’s contemporary art quilt book: “Spirit of the Cloth”. Her work is part of the permanent collection of the Museum of the American Quilter’s Society in Paducah, KY.